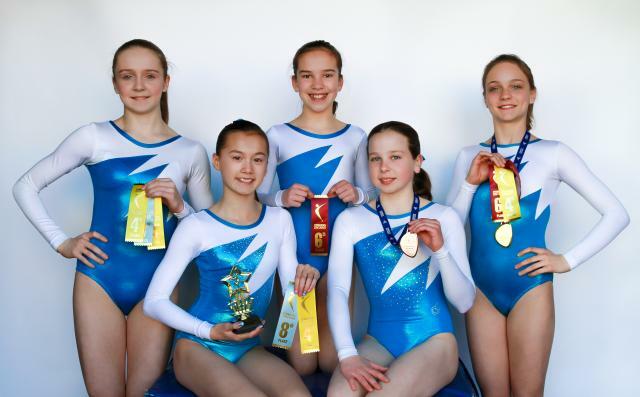 The Northern Stars Provincial level gymnasts enjoyed an exceptionally successful 2013 – 14 season with all eleven qualifying among the top 32 in their level to the Ontario Championships that were held in Windsor in April. Six of the gymnasts placed in the top ten Overall, with the top placing being achieved by Lauren Dejean (Level 5, age 11) who finished second and also won a silver medal on Vault. A performance of particular note was that of 17-year-old Brittany Campbell in the level 8, age 14 and over category, who won Bronze on Bars and Gold on Floor in the All-around competition, and followed this up with Silver medals on Beam and Floor in the Event finals. Also winning medals in the Level 5, age 10 category, were Rowan Allinson with a Gold on Beam, Charlize Stoddart with Gold on Floor and Bronze on Vault, and Alexis Banfalvi with Bronze on Beam. Rachel Van Namen (Level 6, age 9) won Bronze on Vault. The competing gymnasts were: Rachel Van Namen, Alexis Banfalvi, Charlize Stoddart, Rowan Allinson, Kierstin Barkell, Breanne Beardsall, Lauren Dejean, Grace Worfolk, Hannah Scharf, Sarah Worfolk and Brittany Campbell. 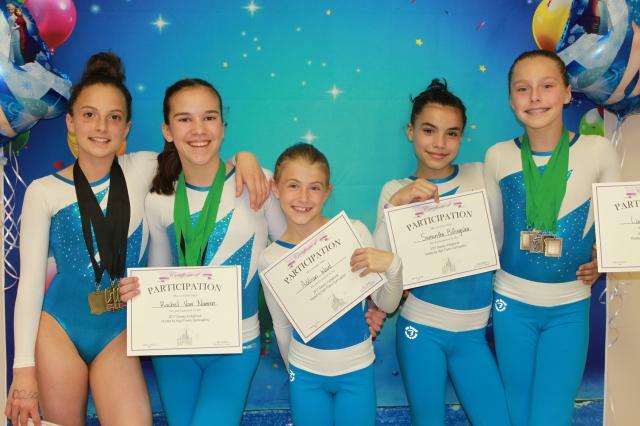 Two Northern Stars gymnasts competed for Team Ontario in Level 9 in Las Vegas on January 17th. 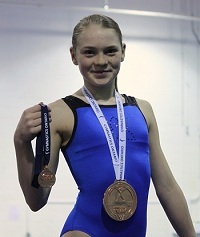 Sarah Worfolk won four individual medals in finishing third in her age group, Silver on Vault, Beam and Floor as well as a team bronze, while Hannah Scharf was the gold medalist on Beam in her category where she finished fourth overall, and was also part of the third place Ontario team. Northern Stars gymnast Hannah Scharf, competing at the Ontario Championships in Windsor, April 9th to 12th, qualified for the second time this season to the Ontario team by finishing fourth All – Around in the Level 9 age 12 and 13 category. Her performance was highlighted by a Gold medal routine on Floor, and she will now travel with the four member team for her level to the Eastern Canadian Championships to be held in Moncton in May. Among other highlights, Sarah Worfolk demonstrated power on Vault both in the All – Around in Level 9, Age 14 and over, and in the Event finals, finishing just outside the medals with a fourth place finish on each day. Kierstin Barkell and Rachel Van Namen significantly improved from their qualification ranking to end up 16th and 17th respectively All – Around in the Level 7, Age 10 and 11 category. Barkell’s results included a Bronze on Floor. In Level 6, Age 12 Lauren Dejean competed with consistency across all four events to finish in 10th place All – Around. 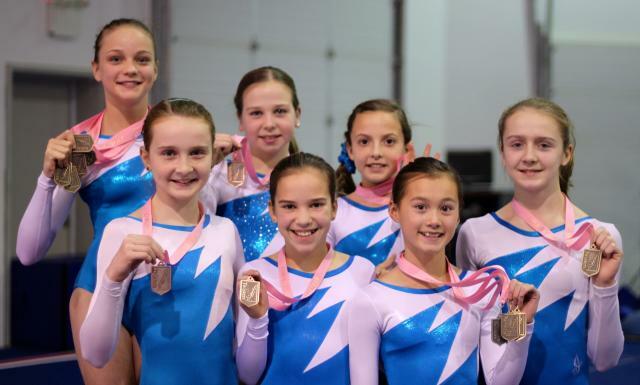 Twenty five gymnasts from Northern Stars qualified successfully to compete at the Ontario Championships held in Toronto in April, and London in June. Highlight performances included second overall for Taeya Maidich, third overall for Sarah McArthur, Bronze medals on Beam and Floor for Rowan Allinson, and Gold on Floor for Samantha Billingslea. In addition there were many individual medal routines and top eight overall and event placings by the other Northern Stars athletes. Twenty tree gymnasts qualified to represent Northern Stars at the season ending Ontario Championships in London on May 31st to June 3rd. Seven of the gymnasts finished top 12 in Ontario with Sophie Dalziel placing first All Around in Level 3. This event concluded a successful competition season for Northern Stars. Competing in levels from one up to nine the gymnasts from Northern Stars enjoyed a highly successful event at the Mississauga Classic held at the Hershey Sports Zone on May 18th to 20th. Seven athletes in the age nine and over groups succeeded in placing first overall in their categories, with many others also finishing top three all – around with numerous individual event medal performances. An additional seven gymnasts participated in the seven and eight year olds categories where they were also very successful in winning both all – around and event medals.